What is the Gongfu Tea Ceremony? The Gongfu Tea Ceremony is a traditional art-like form of serving Chinese tea. Gongfu means the art of doing something well. In the tea ceremony known as gong fu, the implication is that time, dedication and effort will produce an ultimate tea experience. The phrase is also spelled as kung fu, kung fu-cha or gong fu-cha. Looking for the perfect Gungfu Ceremony Tea tray to serve up your tea skills? Look no further because this beautiful solid wood tea tray is the best on the market. First, the drainage style construction is perfect for those who tend to be a little more prone to spillage. The tiny slats allow the excess tea to drain into another tray, which can be easily removed and cleaned. Also, the tray size is perfect for about 4-6 people, with dimensions 21.2 x 13.4 x 2.36 inch. In addition, there is a section where you can even dry your tea cups when finished. In the end, we absolutely LOVE this tea tray and know you will too! What's better than bamboo? Well, fewer things when it comes to a Gongfu Ceremony Tea tray. That's why we absolutely LOVE this tray because of it's sturdy bamboo construction and beautiful design. If you've got the wobbles in your hands, have no fear. This incredible construction has slats that allow extra tea drippings to flow into a removeable tray tha's easy to clean. Plus, the bamboo wood doesn't rot and is water proof. This tray is 36cm x 26cm or 14" x 10.3" and can serve up to 4 people at a time. ​Ultimately, you wil LOVE this bamboo tea tray. Whether you're a beginner tea pourer or a master, this is a gorgeous tea tray to add to your tea arsenal. 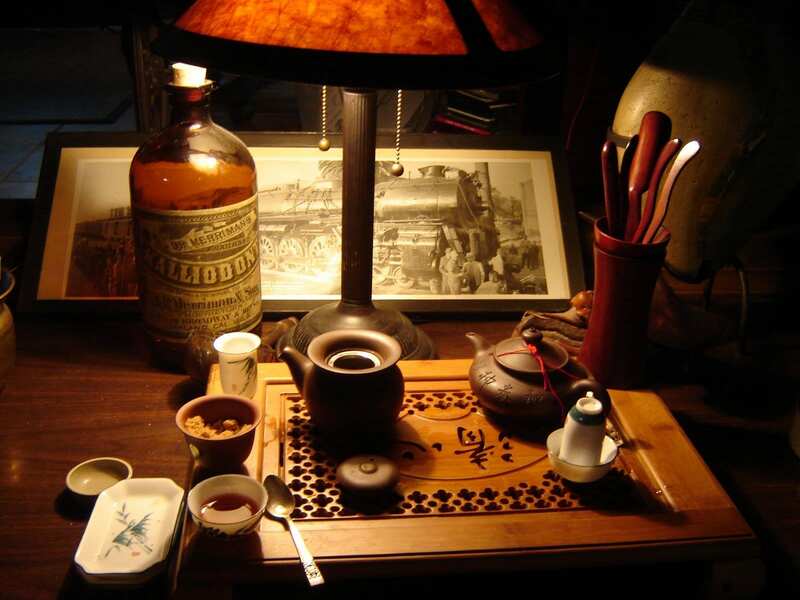 One of the best parts of serving your Gungfu tea is displaying it on a gorgoeus traditional Chinese table. This bamboo reservoir table is perfect for doing so! As you can see, there are tiny holes that allow any wasted water to flow directly through the trash. So, if you're a messy tea drinker, have no fear! This beautiful table is made of high grade thick Chinese Moso bamboo, polished smooth surface, beautiful detail design. The slatted trays with a water collection basin makes it easier to serve the tea and clean up. Tray Size: L21.06" x W11.81" x H3.15"
Ultimately, we know you will fall in love with this gorgeous handmade table. If you're looking for something as close to traidtiional as you can find, this is the table for you. This gorgeous Gungfu tea ceremony ornate table is engraved with traditional Chinese decorations. Also, this table has special engraved holes that allow excess liquid that spills over to flow into a tray for easy clean-up. If you're just a beginner at serving tea, this is a great table for your. Coming in at 15.7 x 11 x 2.95 inches, there is plenty of space for you to practice on. Also, the catch tray is very easy to use and clean. ​Overall, ​if you're serious about starting your journey into Gungfu ceremony tea, this is definitely the table for you to use. Need the perfect Gongfu Tea Ceremony set? We got the product for you. This gorgeous tea set is made in China from beautiful porcelain. The set includes 1 tea pot+1 tea bowl+1 tea plate+6 tea cups. Each item in this tea set is made with the perfect combination of porcelain and stone base, which allows for a sleek look and a sturdy build. Also, the set is completely non-toxic and environmentally friendly. If you're a fan of tea, this is the ultimate Gungfu Ceremony tea set on the market. We guarantee you will absolutely love the design, feel, and efficacy of this product. If you're looking for the perfect Gungfu tea pot to add to your collection, this is the one for you. This gorgeous tea pot is handmade in China with the finest Zisha. Coming in at 12x9x7.5 cm/ 4.7"x3.5"x3" and about 180 cc, this is the perfect sized tea pot to exceute your Gungfu tea ceremony. Also, one gorgeous characteristic of this Zisha tea pot is the more times you use it, the more brilliant the color turns. It essentially gets better with age! In the end, we know you will absolutely LOVE this traditional Gungfu tea pot. Once you use it, you won't be able to use any other one!